For David Muñoz, the opening of his first London restaurant is a full circle moment. The Spaniard cut his teeth in the kitchens of Hakkasan, Nahm and Nobu before he opened his much lauded and much laureled DiverXO in Madrid. StreetXO, the first of Muñoz’s ‘diffusion’ line, has been successful enough that he now returns to London with his first outpost. 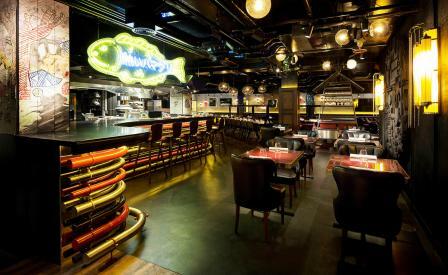 The Barcelona-based designer Lazaro Rosa Violan Muñoz has made the most of Muñoz’s subterranean lair in Mayfair’s Old Burlington Street, compensating for the lack of natural light with mood-lit dark timber floors, clusters of bubble chandeliers, graffiti, exposed piping, and a neon stripped outline of a fish that wouldn’t look out of place in a Ginza watering hole. In the kitchen, Muñoz shows off the mash up cuisine that’s made him almost a standard bearer for Spain’s new generation of chefs – Mediterranean bones fleshed out with Asian and South American influences. To whit: a cocktail of jasmine and coconut vinegar, or an aged rum swirling with tea and ginger at the bar that takes its visual cues from a street vendor’s cart. All this a prelude to a dinner comprised of sharing plates, with the marquee attractions of Chinese dumplings paired with fried pigs’ ears and strawberry hoi-sin sauce, and kimchi croquettes with tuna steak and burnt butter.